Aston Martin is testing the market for very expensive full-electric cars with the Rapide E sedan, which was unveiled on Tuesday at the Shanghai auto show. Aston Martin will build just 155 units of the Rapid E, which will be the automaker's only battery-powered car until the UK automaker revives its Lagonda brand as an all-electric marque early next decade. CEO Andy Palmer said the debut of Aston Martin’s first EV was a “huge moment” for the company. "As a car company we cannot afford to passively allow that future to come to us; we have to actively chase it," he said in a statement. The automaker did not disclose detailed pricing for the Rapide E. It will cost in the "ballpark" of 200,000 pounds ($260,000), Aston has said. The Rapid E's driving range of 322 km (200 miles) under Europe’s WLTP testing cycle is short compared with other EVs coming to the market. The upcoming Porsche Taycan has a 500-km (311-mile) range), for example. Aston Martin has countered the Rapide E’s limited range by equipping it with an 800-volt battery system that allows more rapid charging. The sedan can be charged to 80 percent of capacity from empty in 30 minutes. 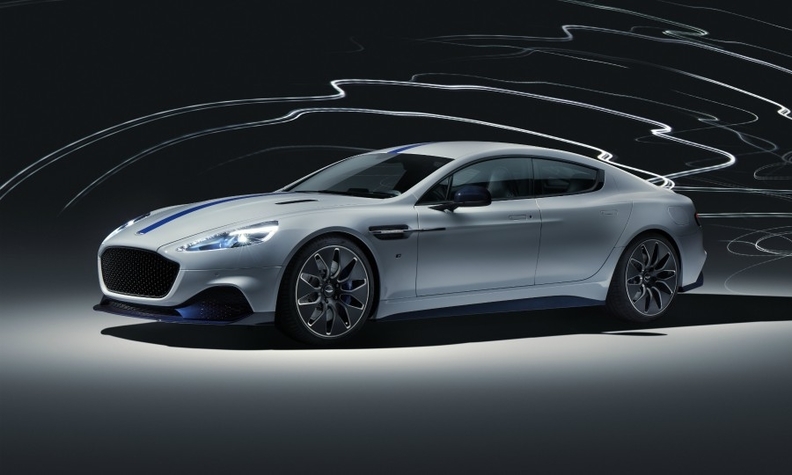 The Rapide E’s 65 kilowatt-hour battery pack is positioned where the V-12 engine and drivetrain were located in the conventionally powered Rapid sedan. The pack has 5,600 cylindrical cells arranged in a pack designed in a rough dumbbell. The battery pack has been developed with the commercial arm of the Williams Formula One team. The Rapide E weighs 2,140 kg (4,718 pounds), which is 150 kg heavier than the Rapide AMR. The high-voltage system means the battery is not power restricted, or de-rated by repetitive high-performance use, Aston said. Aston Martin says the Rapide E is 8 percent more aerodynamic than the gasoline model. The Rapide E can complete a full lap of Germany’s Nuerburgring long-distance racetrack without loss of performance, the automaker said. It can accelerate from 0 to 60 mph (97 kph) in less than four seconds, faster than the Rapide AMR gasoline version. Top speed is restricted to 155 mph (250 kph). Palmer said Aston Martin customers are not looking for blistering supercar performance, but they are "conscious about what Teslas can achieve." The Rapide E’s design has been subtly changed on the outside to improve aerodynamics over the internal combustion Rapide. It uses 21-inch “aero” wheels and has a new honeycomb grille to reflect the reduction in cooling needed. 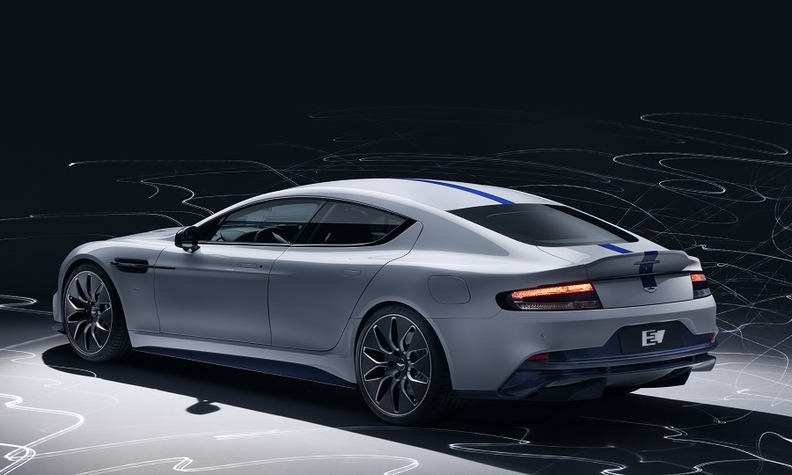 Together with a new underfloor and rear diffuser, the changes make the Rapide E 8 percent more aerodynamic than the gasoline model, Aston said. The Rapide E will it go into production in the fourth quarter as the first model to be built in Aston Martin’s new factory in St Athan, South Wales. The automaker’s DBX SUV will also be built there starting next year. The DBX will be sold only with a gasoline engine. Aston Martin's EV offensive will start in earnest in 2022 when it launches a Lagonda SUV previewed by a concept at the Geneva auto show in March. At the Geneva show, Palmer said the market for ultra-luxury electric cars is still limited. "There isn't a huge call for electric from customers, that’s the truth of it. Basically it’s legislation that’s pushing it," Palmer told Automotive News Europe. Lagonda is being revived as an electric-only challenger to Bentley and Rolls-Royce. A Lagonda electric sedan is also planned. It was previewed by the Vision Concept in 2018. Rolls-Royce will launch an electric car "in the next decade," CEO Torsten Mueller-Oetvos told Automotive News Europe earlier this year. Bentley has ruled out a full-electric car in the medium term, citing range limitations on current lithium battery technology.